An English cheese that is produced by inoculating milk curd with a harmless mould which gives this cheese its characteristic flavor. Blue cheese is a general classification of cow's milk, sheep's milk, or goat's milk cheeses that have had Penicillium cultures added so that the final product is spotted or veined throughout with blue, blue-gray or blue-green mold, and carries a distinct smell. Procuring: Blue cheeses grow more pungent with age or mishandling, and it's best to use them within a few days of purchase. Like almost all cheeses, blues should be brought to room temperature before serving. The unique flavor of blue cheese is typically appreciated at room temperature either alone or served with fruit, crackers and wine. It has a flavor which varies from nutty to sour or tangy. Blue cheeses are strong, rustic-flavored cheeses and go best with similarly strong, flavored foods and drinks, and with tannic red wines. Firm blue cheeses such as Stilton should be wrapped in waxed paper and then either placed in a re-sealable plastic bag or plastic wrap. Then store it in your refrigerator drawer. All other blues should be placed unwrapped into an airtight plastic container with a few holes poked into it and then stored in your refrigerator drawer. 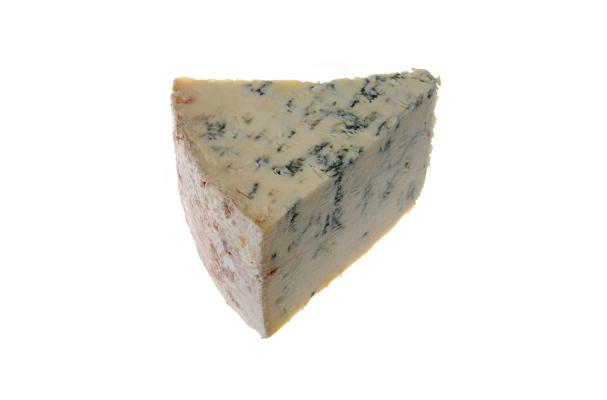 History: Blue cheese is believed to have been discovered by accident. The caves in which early cheeses were aged shared the properties of being temperature and moisture controlled environments, as well as being favorable to many varieties of mould. Roquefort is said to have been invented in 1070 AD. Gorgonzola is one of the oldest known blue cheeses, having been created around 879 AD, though it is said that it did not actually contain blue veins until around the 11th century.